Singin Wid A Sword In Ma Han Theater website. The old Christian hymn, Singin' Wid A Sword In Ma Han, Lord, inspired this gripping tale of love and escape on the Underground Railroad. An American Radical. Book site by author Susan Rosenberg. Cheree Dillon. Website for award-winning film editor Cherrie Dillon (all trailers/video shot by Cherrie Dillon). Vietnam Agent Orange Relief & Responsibility Campaign (VAORRC) Advocacy website for U.S. Vietnam veterans focusing on justice for all victims of agent orange. Coca-Cola Anarchist This author website promotes the memoir of an heir of Coca-Cola and uses old home video to great effect. BSVAC.org All volunteer nonprofit ambulance corp. Their first website. The embedded newscast video has brought them tens of thousands of dollars in donations, a donated ambulance, volunteers and more! afterhoursproject.org A nonprofit serving IV drug users who has added a great deal of content to their website by themselves. 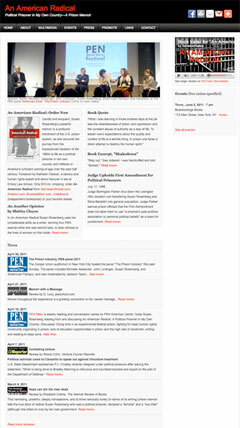 toolsforradicaldemocracy.com A book site by community organizers. Vancortlandt.org Bronx nonprofit site that has enabled them to increase visibility, volunteer recruitment and foundation giving. Noise: The Movie Promotes the New York City-based movie directed by award-winning director Henry Bean. Turning Point is a New York City, community based, non-profit organization addressing the needs of Muslim women and children through crisis intervention, individual and group counseling, advocacy, outreach, education and training. Their website has enabled them to raise the issue of domestic violence, reach a difficult to find audience, attract volunteers and funding.